Chaucer’s Canterbury Tales – Muslim Museum UK – Uncover the 1400 year relationship between Britain and Islam. Explore the history and heritage of Muslims in Britain. Geoffrey Chaucer (c 1343-1400), is known as the Father of English literature, and widely considered the greatest English poet of the Middle Ages. He was crucial in developing the legitimacy of using the English language, at a time when the dominant literary languages in England were French and Latin. 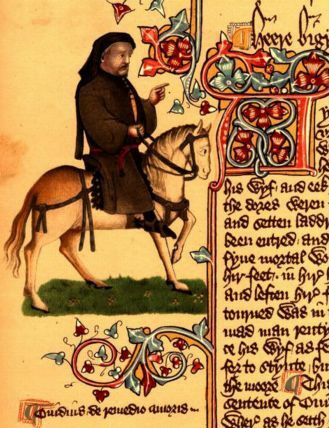 Chaucer is best known for writing The Canterbury Tales, written between 1387 and 1400. It depicts a pilgrimage by some 30 people, who are travelling to and from Canterbury. They amuse themselves by telling stories. There are references to Islamic scholars in these tales. 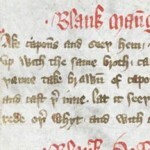 In the prologue Chaucer introduces a character who is ‘a Doctour of Phisyk’ whose learning includes that of ‘Razis’, ‘Avicen’ and ‘Averrois’. Razis refers to Muhammad ibn Zakariya al-Razi (854-925), who was a Persian Muslim polymath, a prominent figure in Islamic Golden Age, physician, alchemist and chemist, philosopher, and scholar. Avicen refers to Avicenna or Ibn Sina (c980-1037), who was a Persian Muslim polymath, who wrote on a wide range of subjects, in particular, philosophy and medicine. Other writing includes; astronomy, alchemy, geology, psychology, Islamic theology, logic, mathematics, physics, as well as poetry. 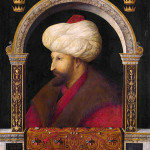 He is regarded as the most famous and influential polymath of the Islamic Golden Age. Averrois refers to Ibn Rushd (1126-1198), who was an Andalusian Muslim polymath, a master of Aristotelian philosophy, Islamic philosophy, Islamic theology, Maliki law and jurisprudence, psychology, politics, Andalusian classical music theory, and the sciences of medicine, astronomy, geography, mathematics, physics and celestial mechanics. In ‘The Tale of the Man of Lawe’ it mentions Muhammad (Mahoun – ‘That us were taught by Mahoun our prophete’) and the Qur’an (Alkaron – ‘The holy lawes of our Alkaron’). The tale speaks of Islam as a monotheistic religion in which the holy laws are revealed through the Qur’an. The story portrays Islam as being a complete set of laws and beliefs. However, in spite of Chaucer’s knowledge of Islam, the story represents Islam as the ‘other’, and is full of prejudices against and misconceptions about Islam. The lead ‘evil’ character is Muslim.